Your most efficient and effective route to public relations executives with buying power is via O’Dwyer media—website, magazine and Directory of PR Firms. You’ll join an illustrious roster of established PR firms and service companies that have obtained results by advertising in PR’s most authoritative news media (described as the “bible" of PR by both the New York Times and Washington Post). You’ll reach PR’s most sophisticated, powerful audience which relies on our in-depth stories and extensive databases backed by 50 years of reporting on PR. The “Find the Right PR Firm” and “Find the Right PR Service” databanks are two of the most popular areas. Buyers searching for expertise in 12 specialized areas such as health, tech and finance are often directed to the exclusive O’Dwyer rankings in these specialties. 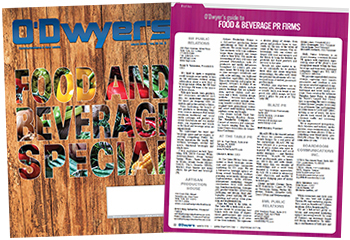 Publisher John O'Dwyer (john@odwyerpr.com) can arrange the right package of advertising to suit your needs and budget. No other PR website can keep up with the quality and quantity of news posted daily on odwyerpr.com. Over 19 years of searchable coverage is available, backed by our experienced reporters. PR and communications pros get their news from us all day long--you need to be in front of that audience. The newsy website averages 60,000 visits per month. We also have 13,400+ followers on Twitter (@odwyerpr.com). odwyerpr.com is designed to give advertisers the best chance of attracting readers' attention without distracting from content. We can accommodate any type of banner (animated gif, jpg, Flash or HTML5), including video and custom widgets. Banners can be changed as often as necessary throughout the course of a campaign. Click tracking can be linked to an advertiser's Google Analytics account or O'Dwyer's can implement custom links specified by the advertiser. O'Dwyer's offers the opportunity for bylined content to be posted to odwyerpr.com. Our editorial staff will have no role in the preparation. Content will appear in the third story position on the main page of odwyerpr.com for two weeks. Cost per placement is $500. Every afternoon our free e-mail newsletter is sent to approximately 4,200 subscribers who have either signed up online through odwyerpr.com or who are subscribers to our website or one of our publications. E-mail recipients trust O'Dwyer's and are receptive to our advertisers. *Premium positions are available (e.g., back cover, inside front cover, 2-page spread, etc.). Send a print-quality (300 dpi) CMYK PDF with all fonts embedded and all layers flattened by the 15th of the month prior to issue date (e.g., Apr. 15th for the May issue). The magazine is printed web offset on 80 lb coated stock. Binding is saddle stitched. Our subscribers, national in scope, are from Fortune 1,000 sized companies (about 40-45%) and from PR agencies of all sizes (about 35-40%.) The remainder come from government agencies, industry associations and the companies that provide products and services to professional communicators. Each month we examine a different area of PR and feature profiles of PR firms with strengths in the focus area. The agency profiles constitute the ideal starting point for companies beginning their search for PR counsel. Profiles must be submitted by the 15th of the month prior to issue date of the magazine. You can, however, add your profile at any time to the web listing of profiles. Cost is $200. A picture can be added for $50. Half and full page advertisers receive a free profile and picture placement. Send copy and either a high-res (300 dpi) JPG or TIF file to magazine editor John Gingerich (jon.gingerich@odwyerpr.com). The 2018 Edition of O’Dwyer’s Directory of Public Relations Firms contains listings of public relations firms and public relations departments of advertising agencies. The Directory’s geographical index reflects the fact that many PR firms operate from multiple office locations. This sorting is carried over into the PR specialty index which identifies firms with skills in 23 areas such as beauty and fashion, food and beverage, healthcare, investor relations, professional services, sports and entertainment, technology, and travel. The directory is the only place where you can look up a company and determine its outside PR counsel. Contact John O'Dwyer, john@odwyerpr.com, for a complete mailing list in Excel format derived from the 2018 directory. We accept files in print quality PDF format via CD and e-mail. Please provide us with a laser copy of the ad. *Premium b/w positions in the directory start at $1,500; color from $3,500. Ask for details. Send a print-quality (300 dpi) B/W PDF with all fonts embedded and all layers flattened. 2019 Directory to be published June '19. Listings in our printed directory of PR firms are also appear in the “Find the right PR firm” database on odwyerpr.com. Basic listing cost is $100. For $300 you can display your firm’s logo and 75-word agency statement (description of PR philosophy and areas of special expertise). Pictures of key executives and even video can be added to the web listing. Send copy and either a high-res (300 dpi) JPG or TIF file to research director Melissa Werbell (melissa@odwyerpr.com). 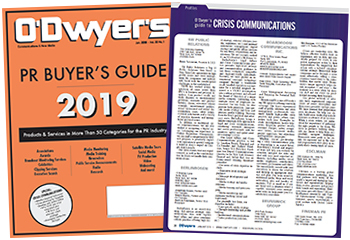 Our January magazine contains our PR Buyer's Guide, a de facto 50+ page directory devoted to the companies that supply the PR industry with products and services. For a comprehensive list of services such as media training, video production, celebrity talent, executive search, camera ready releases and much more, PR people refer to our Buyer's Guide. Listings also appear in the “Find the right PR service” database on odwyerpr.com for a year. This is where communicators shop online for services and products and it is the one web database you need to be part of. Basic listing cost is $25 per category. For $225 more, you can add to your listing 75 words describing the unique nature of your product or service and a color logo. Send copy and either a high-res (300 dpi) JPG or TIF file to john@odwyerpr.com.